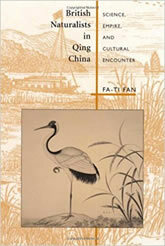 In the eighteenth and nineteenth centuries, Western scientific interest in China focused primarily on natural history. Prominent scholars in Europe as well as Westerners in China, including missionaries, merchants, consular officers, and visiting plant hunters, eagerly investigated the flora and fauna of China. Yet despite the importance and extent of this scientific activity, it has been entirely neglected by historians of science. This book is the first comprehensive study on this topic. In a series of vivid chapters, Fa-ti Fan examines the research of British naturalists in China in relation to the history of natural history, of empire, and of Sino–Western relations. The author gives a panoramic view of how the British naturalists and the Chinese explored, studied, and represented China’s natural world in the social and cultural environment of Qing China. Using the example of British naturalists in China, the author argues for reinterpreting the history of natural history, by including neglected historical actors, intellectual traditions, and cultural practices. His approach moves beyond viewing the history of science and empire within European history and considers the exchange of ideas, aesthetic tastes, material culture, and plants and animals in local and global contexts. This compelling book provides an innovative framework for understanding the formation of scientific practice and knowledge in cultural encounters.